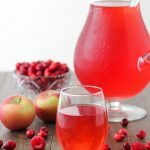 Kompot is a popular Russian drink that is made from cooking fruit and/or berries and this one is made with cranberries, raspberries and apples. It can be made with fresh or frozen fruit and berries, it’s not too sweet and is so refreshing. Place the cranberries, raspberries and apples in a large 8-10 quart stockpot. Use a vegetable peeler to take off the outer peel of the clementines or orange. The peel is so full of aromatic oils and will give the the kompot so much fragrant and fresh flavor. Set the clementine/orange peel aside. For the actual clementine/orange, you can do one of two things – remove as much of the white peel as possible and add it to the pot. Instead of cooking it with the rest of the fruit, you can also squeeze out all the juice and add it to the kompot after it’s done cooking and cools off. Fill the stockpot all the way to the top with water. Cover and bring it to a boil, then reduce heat to a simmer and cook for about 15-20 minutes, until the berries and apples have softened. Strain the kompot drink through a fine mesh sieve. Discard the cooked fruit. Store the strained drink in glass mason jars in the refrigerator after it has cooled off to room temperature. Place the citrus peel inside the jars of kompot. As the drink cools and stands, it will absorb the fragrant flavor of the citrus peel, giving it a surprising and intriguing flavor. Sweeten with sugar, honey, agave syrup, stevia or any other sweetener that you prefer, adding it to the compote while it’s still hot or right before serving. If you use sugar, it is much easier to dissolve if you add it while the kompot is still hot, but you can do it any way that you like. You can also add club soda/seltzer water or any clear soda, like Ginger Ale, Sprite, etc. to give it some bubbles and additional flavor. You should have about 24 oz of kompot after it has been cooked and strained. The kompot will last 3-5 days in the refrigerator.